Extremely durable topside paint for aluminum and galvanized metal boats. Chromate-free formula dries fast, creating an attractive, low-sheen finish that resists corrosion, abrasion, chemical damage, and fading. No priming necessary. Perfect for aluminum duck boats, bass boats, jon boats, layout boats, dinghies, canoes & pontoon boats. Available in 6 colors. Left to the elements, aluminum boats form a tough oxide film that resists corrosion—but that protection isn’t pretty. Some duck hunters and anglers see oxidation as a thing of beauty, but if you’re wanting to ditch that dull, dusty, gritty, gray look in favor of an attractive, non-reflective finish, apply a few coats of TotalBoat Aluminum Boat Paint. Fast-drying formula does not require priming, and provides a smooth finish that doesn’t just look good, it helps reduce drag. With TotalBoat Aluminum Boat Paint, you can start painting sooner and finish faster because it bonds strongly to properly prepared substrates without requiring etching or priming. It also dries extremely fast, so you can recoat without sanding in just 1 hour (@ 72°F). Apply 2-3 coats, wait 12 hours, sand before the final coat. That’s it. This low-odor, eco-friendly solution is also easy to clean up with soap and water. Without a doubt, bad weather means good fishing. Good waterfowl-hunting weather can also be downright foul, with high winds, driving rain, and bitter cold. Aluminum boats can take a real beating not just from the elements, but from spilled chemicals and hard use. TotalBoat Aluminum Boat Paint adheres strongly to form a long-lasting coating that protects against chemical spills, corrosion, water damage, and abrasion. No rusting, fading, chipping, or peeling—just a tougher, more durable finish. Whether you’re duck hunting from a layout boat hiding in plain sight, waiting in a boat blind tucked among the reeds, or jigging from a jon boat, our durable Aluminum Boat Paint comes in colors that help conceal your boat from things that fly over it or swim under it. For anglers, in case it matters to the fish—or at least you think it might—you can paint the bottom of your boat in fish-friendly colors like White, Light Gray, or Black, so they’ll think you’re nothing more than a harmless cloud drifting overhead. For duck hunters, it’s easy to paint a custom camo pattern using Khaki, Earth Brown, and Army Green with stencils you create yourself or buy online. For maximum concealment, choose stencil patterns that mimic the foliage in your lake, creek mouth, or ocean setting. Just prep the boat as directed, then apply paint for one camo layer at a time. It’s also great for blinds, trailers, and other things you might want to hide with a non-reflective finish that blends into natural settings. Storage notes: Keep from freezing. Store locked up. 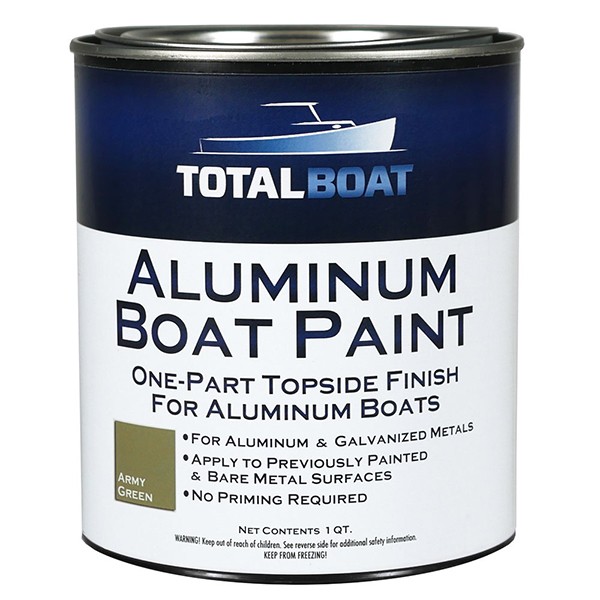 Tips: TotalBoat Aluminum Boat Paint will adhere strongly when applied directly to properly prepared bare metal and previously painted aluminum or galvanized metal surfaces in good condition. 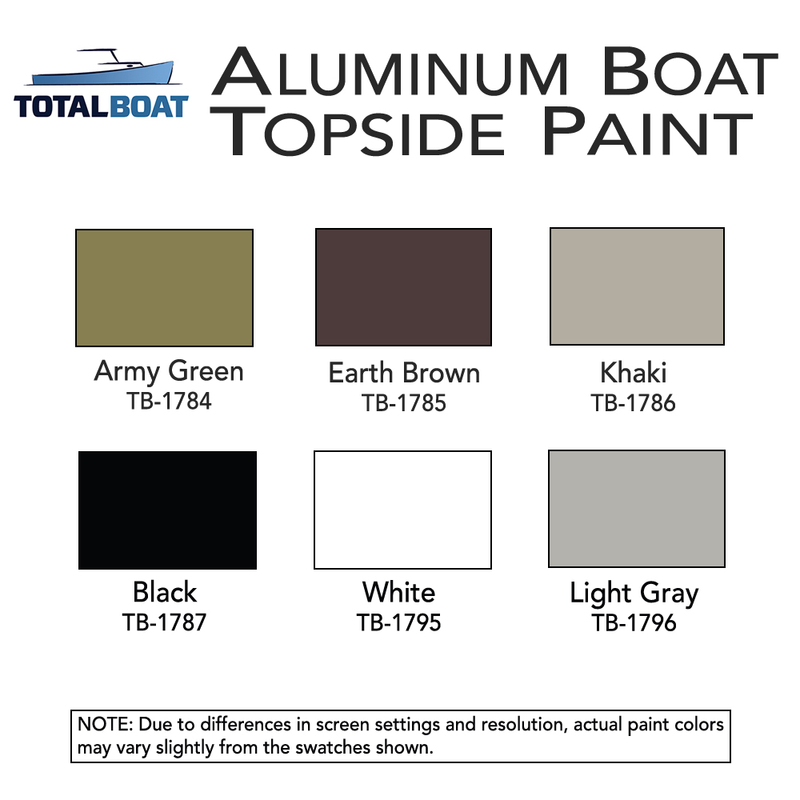 For maximum adhesion on bare aluminum, we recommend applying TotalBoat Aluminum Boat Etch Wash prior painting. For superior antifouling protection below the waterline, we recommend TotalBoat AlumiPaint AF, a bottom paint specifically formulated for aluminum boats. To make it easy to prep and apply paint, elevate your boat for better access. If your boat is trailered, the TotalBoat Trailer-Mounted Boat Lift lets you raise your boat off the trailer by yourself for painting and maintenance. It’s adjustable to accommodate a wide range of boat sizes and shapes. If your boat has any leaking rivets, cracks, or seams, use our 2-part epoxy adhesive sealer to make quick repairs before painting.